The scene after Dean Johnson's murder. TWO PEOPLE HAVE been arrested by gardaí carrying out searches connected to the murder of Dean Johnson. During the course of the searches a sawn off shotgun, ammunition and a quantity of drugs were recovered. 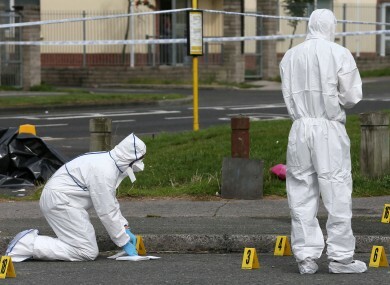 As part of the investigation into the murder of Johnson on 24 August 2013 at Neilstown Road, Clondalkin Dublin 22, gardaí at Lucan, carried out the searches. They were assisted by various local and national garda units while undertaking the searches in the areas of Ronanstown, Clondalkin, Cabra and Kilcock today. Two men in their 20s were arrested. They are detained under the provisions of Section 30 of the Offences Against the State Act 1939-98 and at Lucan and Ronanstown Garda Stations. Email “Shotgun and drugs found during garda searches over Johnson murder”. Feedback on “Shotgun and drugs found during garda searches over Johnson murder”.